Portable Document Format (PDF) is a file format that represents all the characteristics of a printed document that you can read, write and print or forward to someone else. Each PDF file included a complete description of a fixed-layout flat document, including the text, fonts, graphics, and other information needed to view it. 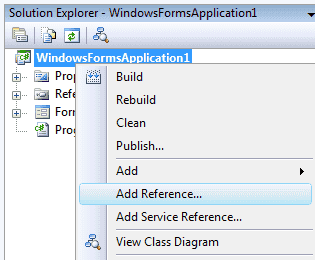 You can create PDF file programmatically from your VB.Net applications very easily. PDFsharp is the Open Source library that easily creates PDF documents from your VB.Net applications. PDFSharp library	allows you to create PDF files directly from your VB.Net application. 6. 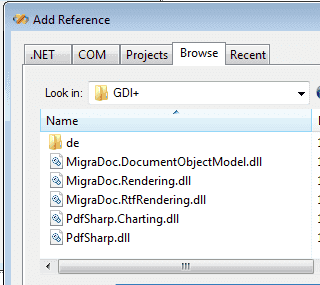 In the Add Reference dialog box, select the BROWSE tab and select the Assebly file location (step 2). 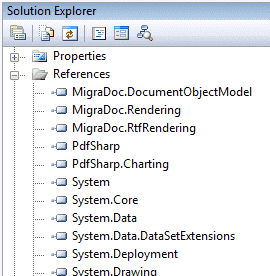 After you add the reference files to your VB.Net project , solution explorer look like the following picture. First step you should Imports the necessary namespaces. pdf.Info.Title = "My First PDF"
Dim pdfFilename As String = "firstpage.pdf"